Near the end of the Russian Civil War, Countess Sophie fall in love with her brother's best friend as the men, German officers, return to the Latvian chateau where they spent their childhood. 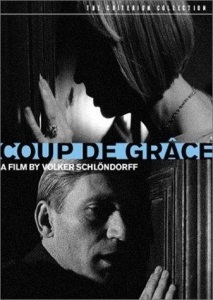 Volker Schlöndorff and screenwriter Margarethe von Trotta adapted the novel of the same name by Marguerite Yourcenar. It's a war film centered on a woman who is neither victim nor subjugated by the men. von Trotta, who also played countess Sophie, practically burns with sexual frustration and boredom. Her love interest (played by Matthias Habich) is a beautiful and cold soldier... except for his smoldering gazes at his best friend. If you like your homosexual subtext to be more than subtext, this is your film. If that doesn't sound tempting, the technical side is masterful. Cinematography, lighting, framing, all of it is gorgeous. In German and French. The Criterion edition has good subtitles. omg this movie. I grabbed it off the shelf at the local video emporium one night, not knowing *anything* about it. Not even the year it was filmed. I just popped it in the vcr and started watching. The opening scene was amazing: b&w, two men jogging down down a road at night with a horse trotting between them, filmed close up, just their heads in profile. I was hooked. That was the first and last scene where I understood what was going on though. I had idly thought it was a WW2 setting, then WW1, then some confusion about Russians and Junkers?? Revolutionaries? Usually it's fairly obvious by the clothes what the time period is but not this time. Most of the film took place in the old house in the middle of nowhere, turned into a makeshift hospital and every so often there was shooting. Everyone was sullen and depressed. The ending was just brutal. Then I watched the extras and was gobsmacked to see in the interview that the lead actress was like 30 years older; I hadn't even twigged her 70s makeup (because the makeup is never historical) because the movie was so disorienting. This all was in a time when I started to go to movies without knowing much, if anything, about them beforehand. No reviews, no trailers. I liked just watching a movie unfold and not always trying to guess what would happen next. This movie though... I just didn't have a clue who these people were. I still didn't know at the end. It was funny in a way. Even the title. I can never even remember the name of this film. That's a crazy way to see this! I respect your sense of adventure. Would you have picked it up if you knew more about it? I have no idea how to recommend it to people because it's an odd setting, depressing as hell, and the only word for the ending is brutal (though not unexpected given its name). But it is so, so beautiful! The scene where Erich talks to Sophie through the door rips my heart every time. If you ever watch it again, hopefully it will make more sense.